Mitchell Smith is a confident young man. At 22 years old with a perfect professional record of 13 wins and no losses with eight stoppages, he has every right to be. Add to that a stream of titles already (Southern Area, English, WBO European and WBO Inter-continental) and it is clear to see that this young fighter has achieved more in 13 fights than a lot of boxers do in their careers. I am speaking to Mitchell less than one week after his first round demoliton job of Philippine fighter Dennis Tubieron (19-5-2) at Wembley (SSE) Arena. The fight ended when Smith landed a heavy right to the body - did he anticipate such an early night? "I was expecting more of a slippery fighter, for him to make it less of a fight and get out the way" Mitchell tells me. "I wasn't expecting to pin him down so early or for him to be so flat-footed, but I found my distance straight away and backed him in to a corner then landed my special shot! I wasn't too surprised about stopping him - I was so confident of getting him out of there. I thought it may take me the first round to find my distance, come out in the second round and land my shots - I said to my trainer and my dad in camp to not be surprised when I land one clean shot he will go over. He never took me out of my rhythm. " Tubieron was supposed to be a fighter that would give Mitchell Smith some rounds. The fight was for the WBO Inter-continental title, a belt which has helped raise the Harrow born and bred fighter in to the top ten of its ranking. The Philippine southpaw had only in April given Josh Warringto a full twelve round fight, testing the Leeds fighter throughout and showing good spirit and willingness to battle in a cauldron atmosphere. So did Mitchell find the southpaw opponent an issue? "As an amateur I only boxed two southpaws out of 58 opponents - as a pro I have now fought Peter Cope (in Juy 2014) and Tubieron. My key against them is that my footwork is so good it helps me find my distance,"
So as a fighter, does it frustrate them to go through the pain and hardship of an 8-10 week training camp, only to have a fight night that would allow them to catch the night bus home? "No, it's not annoying at all! The hardest thing about boxing is campes, coming down in weight, the rounds of sparring and the miles of running on the road - that's what takes it out of your body. If you then have a hard fight, it's like a double impact on your body, so to finish it in a round is perfect! Also going in to that fight I had a broken nose, so it was nice not to go in to the trenches and take too many punches." With that in mind, how much of Friday nights performance was aimed at making a statement not just about his own skillset, but to domestic rival Josh Warrington? "Of course it was my intention to make a statement. I want to be the best in the world, to be talked about in the future. That means doing better than anyone else does." The conversation doesn't go on too long before we touch on his domestic rival from Leeds, Mr Warrington. "People slate me for talking about it when I haven't made 126lbs yet, and I can understand where they're coming from, but people are still talking about it. So when I do make 126 and it does happen, it will be MASSIVE. That's why I talk about it, because my weight specialist has told me that in the future I can make 126 comfortably. We can both make a nice pay packet and the British public get what they want." Smith's excitement and youthful exuberance make you want the fight even more as a fan. But this is boxing - there have to be hurdles put in the way! It's not quite as simple as the two fighters stepping in the ring - Smith fights for Frank Warren on BoxNation, and Warrington is a Matchroom fighter on Sky Sports. The business side of the sport is what ultimately decides on matchmaking. Warren himself recently went on record to declare he would be happy to see the fight made via purse bids. Should the politics be put aside, is it a personal matchup for Smith? " I haven't got anything against the kid, I don't dislike him and I'm not jealous of him. I just feel he doesn't deserve to be where he is right now - people talk about him like he's special and it's frustrating because I have more talent in my little toe than he has in his whole body." "It's laughable - I'm a better fighter than him even when I'm out of shape and unfit, it's crazy. He doesn't do anything special - he sells 10,000 tickets and sells arenas out - he's Eddie Hearn's golden ticket and earning himself a few quid so fair play to him. But I get the hump because people have spoken about me and him, but I would literally school him. 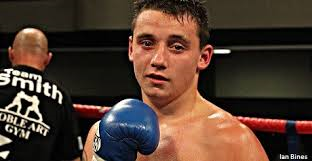 A 50% Mitchell Smith would demolish Josh Warrington. He's got a great engine but that's it - he hasn't got a good jab, he can't punch, he hasn't got a good right hand, he doesn't throw shots particularly well and can't put shots together." That covers that chapter pretty conclusively then! Smith knows it's a business and that ultimately, money talks. "It's a short career, it's out job, once it's finished there's no more income any more so we have to get the big fights when we can. So in the meantime why not a bit of trashtalk and shake hands after?! I love it, I think it's great!" Mitchell Smith isn't the first fighter to utilise the art of disparaging comments about other fighters with the aim of making the fights better - but it would be fair to say he is one of the better ones. When I put it to him that there are other domestic fights out there for him, I brought up the name of Northern Irish featherweight Marco McCullough. "I don't feel like Marco McCullough is even worth talking about really. I'd rather go for a stroll in the park - he's boring, he gets hit too easily and I prefer someone who would hit back. If it's a possible fight that could put me on to something bigger and better at featherweight, it might even be a first fight down at featherweight, then we might do it. But there's nothing he does that is special." He might only be 22 with 13 professional fights, but Smith has years of experience behind him. He entered his first boxing gym at the age of six and has loved it ever since. But with time on his side still he is also realistic about the progress he is making. "I've been in the gym with good fighters, I've sparred good fighters and boxed at a high class as an amateur. Now I've stepped up as a pro I'm maturing in age, I'm taking the steps slowly but surely and making big statements in the ring - people are talking about me and as long as people are talking about me I'm earning money." So does he feel that the step up to world title level is far away? "I'm potentially three or four fights off of a world title. I believe I can be a world champion by the time I'm 24, 100% as long as I stay injury free. I don't want to be in a world title fight, I want to win a world title. My destiny is to win a world title, it has been since I walked in the gym at the age of six. Even if it was only for one fight, it would mean I could look back at the end of my career and say I achieved all that I wanted to achieve. I've been through a lot of ups and a lot of downs in my career so far and I'm sure I haven't seen the last of them, but it's a big thing for me to win that world title. It's all about taking it at the right time, not rushing, I have age on my side and the future's bright." "His name got put to my name and I just said I will fight anyone, it doesn't matter as long as I feel I'm ready. Someone may have taken it the wrong way - right now can I beat Lomachenko? No, I can't beat Lomachenko right now. Can I beat Lomachenko though? Yes, 110% I can. I think he's a great fighter, but I'm a big puncher and he's already been beaten as a pro so he's tasted defeat. He might be one of those fighters who has such a successful amateur career that his body or his mental side thinks he has done enough in this sport. In a year and a half to two years I do believe I can beat anyone in the world." Again that confidence exudes out of the young Londoner, as comfortable talking out of the ring as he is fighting within it. He is going to be taking most of August away from the gym, with the intention of fighting at the back end of October "Nothing has been suggested yet, we haven't got a date, opponent or a venue. But that's the aim." There are a certain group of people that will be anticipating his return - his fans. At the SSE Arena last Friday they were heard loud and clear cheering on the hometown fighter. He has built up quite the following already - something he acknowledges is as important to him when he fights as it is when he is looking at the business of making fights. "It is a business and if you don't bring in money on tickets it's going to be hard to earn any money from the sport. I'm very grateful to those that come out and buy tickets to watch me fight. I've always said from day dot that the bigger the crowd, whether my side or against me, the more I will impress. When I was in the gym at 6, 7, 8 years of age I would get on the speedball and people would stand and watch - the more people that were watching the quicker I would hit it. It's in me to perform for people and I just love giving the crowd what they want." So with one set of vociferous supporters in Harrow, and another set at the Northern end of the M1, is there a final word about the man from Yorkshire? "I would love to go to Leeds and fight Warrington in front of his crowd - even if I only took 1,000 of my fans and there were 10,000 of his I would just love to show everyone in there what I can do. He draws a great crowd and I would love to shut them up! You would hear a needle drop in that gaff when I knock him spark out, trust me. It would be brilliant!" Undoubtedly a North vs South rivalry between two young featherweights would be exceptional. Smith continues making statementsinside the ring and outside - he is business savvy and carries a wise head on young shoulders. He has clearly picked up lessons already within the sport that talk generates interest, and interest generates money. You get the sense that Smith is happy to talk about Warrington not because he sees him as a rival necessarily, but because he sees him as a stepping stone. The plinth that Warrington is held upon would temporarily crumble should Mitchell Smith topple him in his Leeds home. But Leeds isn't the end game for Mitchell Smith - he sees his place as being amongst the elite of the world, not the country. With a loyal set of supporters in tow, Smith may have longer journeys to make than just the M1 in the future.